An upright spreading small tree with dark green summer foliage. 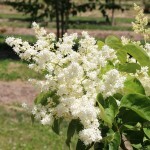 Creamy white fragrant single flowers are arranged in dense, terminal clusters up to 12" long. Very early to leaf out and has attractive reddish-brown bark. Grown both as a single or multi-trunked trees. It prefers full sun in a well-drained soil. It needs good air circulation. Use as a specimen or in small groups. Introduced in 1973 by Sheridan Nurseries.